The astonishing final novel in Richelle Mead's epic series! Murder. Love. Jealousy. And the ultimate sacrifice. Now, with Rose on trial for her life and Lissa first in line for the Royal Throne, nothing will ever be the same between them. -Rose didn't die...and that's basically it. I will promptly burn down a house. An abandoned one perhaps, but a house nonetheless. It makes me that mad because the entire statement is incredibly contradictory to what Mead attempts to portray throughout the series. I've read every book, (perhaps a little addictively), and repetitively that one statement has been IDOLIZED by Rose/every other Guardian and re-stated like a mantra. For the sake of my sanity however, I ignore the utter absurdity of the words and what they stood for: essentially that a group of people (Guardians) would be expected to sacrifice for another (Moroi) and the two races be treated significantly different. The Moroi have prince and princesses, even a ruler, the Queen. Dhampir are lucky if they get assigned to protect a prince or princess and hardly get time off for themselves, whereas the royalty spend ridiculous amount of time holidaying at a virtual resort, Court, without any worldly obligations. a.) A bunch of Dhampir die in the line of duty. b. )A fellow Dhampir/Guardian is suspected of treason without being given so much as a thorough investigation/apt time to gather evidence. No one really suspects anyone but that Dhampir and they all accept that she must be killed. c.) Relationships between Guardians are basically forbidden. Their only real sanctioned relationships (somewhat) are between Moroi, and even then the mere thought of a Dhampir/Moroi marrying is scandalous. Who Marries Dhampir?! d.) The Dhampir might be shoved into the line of duty too young. RING! RING!!! I'd have issues with all the above, and this is exactly why I avoided thinking too much about it, because I knew how badly I would freak; but I'm at the end of the series now and completely out of excuses. I have to stop and consider why something about these ideals is so terribly wrong. - Rose and Lissa are BFFs and that is cool, but isn't there something wrong with one friend believing her life is worth significantly less than the other's? I think there is. - Guardians look like hired help to Moroi. underpaid and heavily taken for granted bouncers. Essentially. -Why is it wrong for Dhampir and Moroi to actually marry? I'll tell you why! Because Moroi believe they are too good for Dhampir and see the class worthy for casual flings and nothing more. That, my friends, is racism in a nutshell. Check out the series, it has tons of that lovely thing called discrimination underlining every page. The Moroi are better. The pale, tall and graceful Moroi are beautiful and protected, whilst the darker and sturdier Dhmapir are put to work and dispensable. I'm not going to tell anyone reading this what to think, but shouldn't we all have a problem with a world like that? Make no mistake, I am not here to tell any of you what to believe. If I was, this rant would be pages and pages long and there is far too much else to get to. Moving on. - The length really was ridiculous. I think that if Mead simple omitted the whole Keeper spin-off, the book would be cut down a good 100 pages/four chapters and possibly rise significantly in value. I wish she'd done that. Those people were so creepy and their being there did nothing for the book; I kept waiting for something substantial to happen and nothing ever did. Everything from their way of life struck me as majorly odd and I was like: "BUY ELECTRICITY!! OR STEAL SOME, WALMART HAS LOTS!" At least TWICE I thought this way. - Also, was I the only one who got the vibe that Rose kind of forced Dimitri to see the light!? What happened to strong-willed Belikov and why was he so indecisive? For that matter why was Rose? WHAT HAPPENED?? Things could have been better, a lot better. The length could have been altered to be an easier read, and the main characters should have remained consistent. 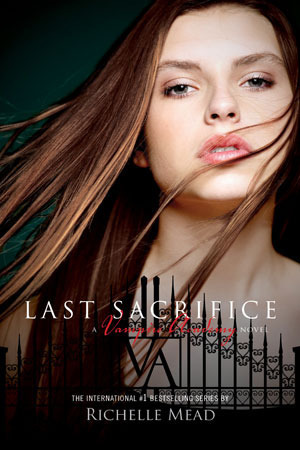 I didn't hate it, but like every book has its issues, so did Last Sacrifice. It was decent and interesting enough, but for a Vampire Academy novel? barely sub-par. 3/5 genies: This book isn't the perfect end to one of my favourite YA/Paranormal series, but it does close things off while leaving an opening for other arcs and spin-offs. Overall, not a bad book, but it certainly could have been better.